Turn heads like never before! You've always known that Zaino Show Car Products create a look that is second to none, but with Z-8 Grand Finale™ Spray Seal , we've taken things to a whole new level. Make no mistake - Z-8 is not a Z-6 replacement. We've designed it to complement the Zaino product line by taking over where Z-6 left off. Z-8 Grand Finale™ Spray Seal offers a unique opportunity to drastically enhance the shine, gloss, depth, slickness and protection of the Zaino system. Leaving for a car show and need an extra boost of gloss? Use Z-8 Grand Finale™ Spray Seal. Heading out on an extended road-trip and want a little extra protection from the elements? Bring along Z-8 Grand Finale™ Spray Seal . Z-8 Grand Finale™ Spray Seal utilizes twenty-five new ingredients to bring you the highest level of shine, the deepest depths of gloss, the slickest feel, and the most protection available in any detail spray, period. But keep in mind, Z-8 isn't for everyone, and it hasn't been designed for everyday use. It's for those special occasions and extreme instances when you need extra performance from the Zaino Show Car Polish System. If you're ready to take your paint to the next level and treat your eyes to the richest, most detailed paint they've ever seen, order a bottle of Z-8 Grand Finale™ Spray Seal and prepare to be impressed. Please note: Using the product in its original concentration will provide the best results. However, some people may find it difficult to evenly spray Z-8™ in its extremely high concentration. To make Z-8™ more user-friendly, you may dilute the product with distilled water, starting with a ratio of 1 part distilled water to 2 parts Z-8™. Test by diluting with small proportions until you find what works best for you. Again, for optimal results, it is best not to dilute Z-8™. Note: Z-8 is EXTREMELY concentrated and can be a little finicky in hot, humid weather, but it is definitely worth it. Using less is better. The vehicle should be relatively clean – Z-8 won't replace a car wash or even a typical quick detail spray. If your vehicle is dirty, wash it before using Zaino Z-8 Grand Finale Spray Seal. Use only plush microfibre buffing towels. Most cars will require two towels. A 12" x 12" towel size is ideal. Working with a cool and dry surface, lightly spray an extremely thin mist of Zaino Z-8 Grand Finale Spray Seal on an area of your paint that is approximately 3' x 3’. Buff immediately with the dry side of your towel, turning frequently. Do not allow Zaino Z-8 Grand Finale Spray Seal to dry on your finish. If Zaino Z-8 dries by itself, simply wipe down the affected area again. For best results, use Zaino Z-8 Grand Finale Spray Seal very sparingly. Like Z-6, a 1/2 ounce will do your entire car, including the rims. 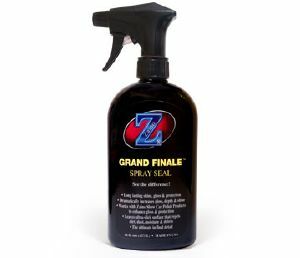 A 16-ounce bottle of Zaino Z-8 Grand Finale Spray Seal should detail your vehicle 20-30 times. Tip: When applying multiple coats of Zaino polish the same day, especially on darker color vehicles we would highly recommend waiting a couple of hours before applying Z-8.